Garmin nuvi 3490 is Garmin’s flagship car sat nav models and the LMT versions features both FREE lifetime European maps and FREE lifetime traffic information whereas the 3490LM only includes FREE lifetime maps. The nuvi 3490 4.3-inch touchscreen navigator also features Bluetooth, is voice activated and has a battery life of up to 4 hours. As with similar Garmin nuvi sat navs, the nuvi 3490LMT features Lane Assist and PhotoReal Junction View. But unlike other nuvi devices the 3490 also includes real-time traffic cameras using PhotoLive Service - requires smartphone app and Bluetooth. Additionally there is an optional speed camera database provided by Cyclops that will warn you to speed cameras. Garmin nuvi 3490LMT has been discontinued. Accessories, spares and parts are still available for your nuvi 3490LMT, as are the road maps. The Garmin nuvi 3490 is the top-of the-range Garmin nuvi car sat nav in the nuvi 3000 series. It has a the thinnest screen of all the satnavs that is only 9mm in depth and has a 4.3-inch touchscreen. Both the 3490LT and 3490LMT have FREE lifetime maps for Europe so you can download them along with the latest street-level sat nav maps up to 4 times each year. What's more if you buy the Garmin nuvi 3490LMT it includes FREE liftime traffic and there are two way to receive it. The first method is via the included GTM 36 FM Traffic Receiver. The second way is with a Bluetooth connection to a compatible smartphone which provides access to Photo-Live Services which features 3D Live Traffic including real-time traffic cameras. The Bluetooth compatibility of the Garmin nuvi 3490LMT allows you to connect the sat nav to the Smartphone link app on your android phone. You can also receive weather and parking information. You can even get fuel prices and navigate to the nearest or cheapest petrol station. This information is updated every 2 minutes. The 3490LMT also has Automatic Orientation meaning you can view in portrait or landscape mode. Plus simply pinch and zoom the screen for the best view of your route. It also features 3D terrain, buildings and landmarks in the view of the route ahead on your nuvi screen. The battery life of this Garmin nuvi is up to 4 hours. The nuvi 3490LMT has Lane Assist and PhotoReal Junction View which will display junctions and road signs in a split screen view one mile in advance of your turning giving you plenty of warning. You can even get Bird’s Eye Junction showing junctions from overhead at complex junctions. You can save 100 routes to the Garmin 3490LMT. Furthermore, the Garmin system includes Eco-Route which will find the most efficient, economical route. Is also calculates routes quickly and efficiently using Guidance 3 navigation technology. It chooses the most fuel-efficient route and it can also tell you the cost of your journey. This Garmin nuvi 3490LMT is Bluetooth enabled and will connect to your phone for making and receiving calls. It will also connect to your phone book, call history, operate by voice-activation and offers SafeTexting which will speak your text messages. Garmin nuvi 3490LMT sat navs contain our unique Cyclops speed camera system, for real-time, direction-relevant and accurate alerts. Get overspeed warning and speed limit information as you approach one of hundreds of fixed, mobile, variable limit and temporary speed cameras. New or moved cameras are constantly tracked and Cyclops checks and updates its central database daily. The Garmin nuvi 3490LMT has been designed to be plug and play, and as such can be transferred from vehicle to vehicle with ease. The Garmin nuvi 3490LMT is powered via the supplied vehicle power cable. The Garmin nuvi 3490LMT then attaches to your vehicles windscreen via the Garmin nuvi 3490LMT suction cup mount. Garmin nuvi 3490LMT is preloaded with street-level here maps (formely NAVTEQ) for both Western and Eastern Europe. To view the map coverage for a specific country or region please click the following links for more details: UK and Ireland, France and Benelux, Spain and Portugal, Germany, Austria and Switzerland, Nordics, Italy and Greece, and Eastern Europe. Further Garmin nuvi 3490LMT maps are available microSD card which insert directly into the Garmin nuvi 3490. 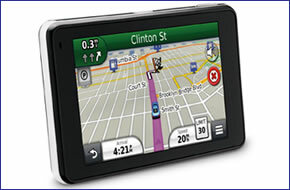 Available Garmin nuvi 3490LMT maps include USA and Canada, Australia and New Zealand, Middle East and Southeast Asia. To view additional maps click here. Looking for accessories and spares for the Garmin nuvi 3490LMT view them all here. All parts are genuine Garmin product and specifically designed for use with the 4.3-inch nuvi 3490LMT sat nav. Looking for sat nav maps for the Garmin nuvi 3490LMT view them all here. All mapping comes on microSD card with SD card adaptor and is genuine Garmin product and specifically designed for use with the nuvi 3490LMT. Countries available to buy include: Southern Africa, USA and Canada and Australia and New Zealand. We are official Internet Retailers of Garmin products and we sell genuine Garmin accessories and maps. We purchase from the Garmin UK distributor. We do not buy on the grey smarket and we do not sell counterfeit products. You can rest assured that by purchasing from ActiveGPS you will receive the full support of Garmin.